Home > Blog > events > The Order of the Coffee Pot Welcomes You! The Order of the Coffee Pot Welcomes You! The DCA cordially invites you to join the Order of the Coffee Pot! 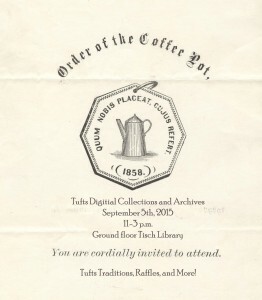 On September 5th as part of Tisch Library’s Freshman Open House, the Digital Collections and Archives (DCA) welcomes new students, their families, and all interested parties to explore Tufts traditions with coffee and iced tea, postcards and buttons, and an opportunity to win a Dunkin’ Donuts Gift card! 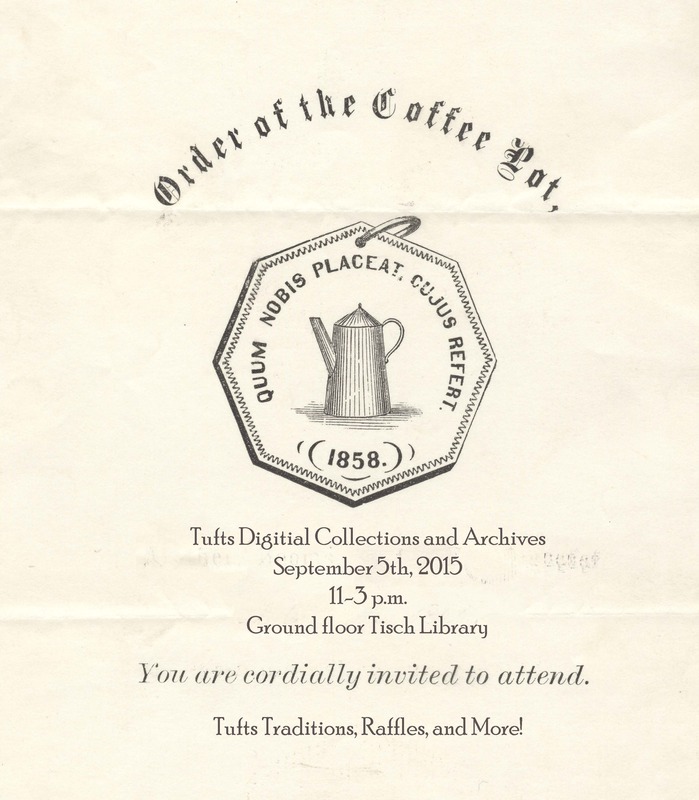 The Order of the Coffee Pot was one of the early secret societies at Tufts. As Russell Miller noted, secret societies at this time were equivalent to fraternities and were not really secret. The Order of the Coffee Pot was exclusively created for upperclassmen in their last two years at Tufts and was formed in 1858 as an offshoot of the Theta Delta Chi Fraternity. Augustus E. Scott, a founding member of the order, recalled the genesis of the group in a 1906 celebration of the Kappa Charge. He explains that after “students who were inclined to more studious things had gone to bed” late night suppers would occur. Food for these late night meals was procured from locked pantries using shovels to extract cakes and pies, while eggs were had from hens located behind their dormitory. Coffee accompanied these treats, providing the basis for late night meetings, and the Order of the Coffee Pot was born. Members of the Order of Coffee Pot were given a silver badge engraved with a coffee pot and the Latin phrase “Quum nobis placeat, cujus referet” – which translates to “Since it pleases us, whose business is it?” This badge was worn at all public occasions where coffee was served. The order lasted for ten years, 1858-1868, eventually dwindling away. In 1951, there was an attempt to revive the Order of the Coffee Pot as a student organization that intended to be truly secret and was formed “to foster good fellowship on the Hill.” As reported in the Tufts Weekly, the new Order of the Coffee Pot was to be a self-perpetuating group manned by two members from the sophomore, junior, and senior classes. Based on a similar group in Bowling Green, Kentucky, the Order of the Coffee Pot was charged with publicizing school events in fun and entertaining ways. These secret members would be revealed at the end of their senior year in the Weekly and new members would be chosen from the freshmen class in secret. Despite the good intentions, no exposé of the members was published in the Weekly; it appears that the Order did not get off the ground. However, we at the DCA thought it was a perfect institution to revive. So on September 5th, in honor of good fellowship and Tufts traditions, we are having our own celebration. Although no treats will have been gathered with a shovel, nor hens robbed of their eggs, we will offer refreshments and a peek into other interesting traditions that occurred at Tufts. We will have a mini-exhibit in the Reading Room touching on some early traditions at Tufts like the Jackson College baby parties, the Horribles parade, the periodic dunking of freshmen at the Reservoir, and beanies and bows, just to name a few. Those who come to the exhibit can enjoy our specially created buttons and postcards and enter to win a gift card to Dunkin’ Donuts, a New England tradition. We look forward to meeting you and inducting you into the Order of the Coffee Pot! Russell Miller, Light on the Hill: A history of Tufts College 1852-1952 (Boston: Beacon Press Books, 1966), 384. Nathan Marvin, “Kappa Charge: Its Founding & History,” Kappa Charge of Theta Delta Chi, Last Accessed September 2, 2015, https://www.kappacharge.org/public2.asp#found . Theta Delta Chi. “Kappa SemiCentennial ” The Shield: Official Publication of the Theta Delta Chi Fraternity, 22:1 (March 1906), 266. Google Book. Alaric Bertrans Start, ed. History of Tufts College, 1854-1896 (Cambridge, Massachusetts: University Press, 1897), 35. Bob Cox, “Coffee Pot Society Formed to Perk Up School Spirit.” Tufts Weekly LVI, 2 (October 4, 1951): 3. Original content in this weblog is licensed under a Creative Commons License. For information regarding licensing Tufts Digital Library content which is linked in this weblog, please contact the Digital Collections and Archives.